I feel deeply privileged to be among you again this year as a participant at SPARC, and was thrilled by the symposium committee’s invitation to join this exciting keynote panel on curation. If the first SPARC symposium and the schedule of workshops for this year, is any indication, there are certainly among you arts curators who have already imagined and realized transformative events in their communities. I can hardly wait to meet you! I am reminded of my encounters with in 2014 with a young dancer bringing together artists on her farm to investigate agriculture, a country restaurant owner who created a music series in her dining room, a theatre director who showed us how she allows epic narratives to spring from particular settings in rural locals. The specific task assigned to me here today by Rachel and Fay is to lay down a framework to foster discussion about the kinds of activist community-minded artistic curators who envision performances and exhibitions as social events that variously serve to celebrate, embody and consolidate the community and so, in the end, to effect social change. (1) Curation is about care, and the term curator originates in the Latin curare whose meaning is “to take care of.” Curators in the earliest museums were seen as care-takers of the “material culture” (the physical objects and traces) of a particular community, society or nation. Within Fine Arts Museums, they were conservators who cared for the art objects from past eras by assuring their restoration, preservation, storage and exhibition. More lately, curators in the contemporary arts have been discussing the imperative to adopt “an ethics of care.” By this they mean that curating is not only a matter of choosing artistic projects within a thematic context for an exhibition or festival, but that their work is essentially that of taking care of relationships between artists, their artworks, the public and the personnel of the arts presenting organization. (2) At the heart of the contemporary curator’s work, and guiding their every move, is the crystallization and articulation of a particular, passionate artistic vision. (This is true of course for artists as well.) Also called a “statement of belief,” and sometimes taking the form of a manifesto, a curatorial vision is grounded in a world view, one’s own personal convictions, a deep-rooted familiarity of the local culture they are working in, and nourished by a continually expanding knowledge of global arts communities. Stemming from one’s own life and art world experiences, knowledge and studies in the arts, an artistic vision is the core from which a curator conceives and builds a programme of artistic events. It is through the filter of this vision that curators accompany the public in experiencing the artists’ work. The term curator may already be familiar to you as a fixture within museums and non-profit galleries, as the person who conceives exhibitions, selecting a thematic framework in which to display the work of a group of artists, or a collection of work from a single artist. There are also independent curators, who choose to work outside the strictures of institutional settings so that they might develop specific projects of their own unencumbered by external bureaucracies. There are also artist-curators and activist curators — such as Clayton, Roselle and myself — who have organized events and sometimes have founded non-profit, artist-run organizations, often out of the desire to help support their local community. All of these kinds of curators engage in creating thematic frameworks in which artists and their art works can engage in dialogue with each other, the public and community, the wider world of the arts, and ultimately, the global arts community. Their daily schedule is usually packed with: in-depth meetings with artists, studio visits and attendance at arts events and symposiums like this one. In the visual arts field, curators are always articulate arts historians and/or critical theorists who are apt to read, write and speak knowledgeably about the arts. In museums and galleries, they are the ones who pen the descriptive wall panels and labels for the art works, work with education departments (where they exist) to devise activities to foster public education and engagement, and they also write in-depth essays for museum exhibition catalogues. One could say that, depending on their job description and position, they might find themselves doing the work of artistic directors and programmers, community workers, copy writers, cultural mediators and educators, artist advocates and advisors, project managers, and more. Does the curator aim to be a meta-artist, ultimately creating an art without artists? Is he/she a neo-liberal agent, fulfilling the market demands even before the market itself demands them, well wrapped in seemingly anti-capitalist discourse? And isn’t it anyway a diluted, empty term by now, when every shop window is subject to curating? One the other hand, within the theatrical, performing arts fields of dance, music, theatre, and also interdisciplinary and “new” practices, there is another history. The idea of the arts-educated and arts-experienced curator is only now beginning to emerge as an official job description for those who call themselves by so many names: artistic director, programmer, creative producer, cultural agent, and many more. Unless an artist-run event or venue, for the most part, theatres across Canada are managed and programmed by “general and artistic directors” with a degree in arts administration, many of whom have adopted a business model in choosing artistic projects for their programming. With their double mandate to manage and programme, they often find themselves with little time to actually meet with artists, and the reflective time to gain deeper knowledge of the local and global art world. I would love them all to consider hiring a curator! It was finally in the new millennium that a movement has begun to lay the groundwork of an actual profession for live arts curation. It was only in 2010 that a first collection of writing was published on the subject of performance curation, by the Croatian theatre journal Frakcija (thankfully for us in English! ), and was followed by the opening of a first university programme at Wesleyan in Connecticut: the Institute for Curatorial Practice in Performance. There is now a second special topic journal from Yale University’s magazine Theater, two more masters’ level programmes for professionals and several classes in various university programmes, our international symposium with its proceedings which we organized in Montréal in April 2014. And the book that anthologizes the Montréal symposium will soon be published with writing from fifty authors: curators, artists, researchers and critics. Turning now to the idea of how curators have been transforming the traditional idea of an artistic exhibition and performance into the kind of event that can effect change on the community, I’ll bring you my vantage point as a culturally-minded dance anthropologist-curator. Since the 1970s, dance anthropologists have written about “dance events,” as they traveled to distant lands in search of “traditional dance cultures.” (Postcolonial anthropologists seek to avoid the political pitfalls of this colonialist history by doing anthropology at home, self-reflexive analysis, and other strategies.) Egil Bakka has characterized these events as extra-ordinary social, cultural (and of course also spiritual) gatherings of dancing and non-dancing participants around the performance of a dance. From their descriptive ethnographic accounts of the nature and function of these events, they tell us that they may take the form of celebrations, processions, ceremonies, rituals or invocations, and even contests, and that they variously serve to increase social solidarity, provide a social safety valve (the catharsis theory), and also functioàn as agent for social change. (This list of natures and functions is not exhaustive.) In my contemporary dance world and through my ethnographic fieldwork with O Vertigo danse, I have come to think of an evening of live dance performance in this way, as if a village dance or, to borrow phrase the late Cynthia Novak that she coined in her ethno-history of the dance form Contact Improvisation, “a temporary community of experience”. We come together to share the experience of contemporary dance, one that we hope might will be meaningful. In this spirit, the curatorial frame of mind that I bring with me each dance performances is tempered by the question: “Who are we, and what are we doing here together?” It is the curator’s undertaking to determine the answer as they go about their work of event-making. The contemporary (also called postmodern) art world in which I live and work, has shifted attention from the classical ideal of contemplating non-utilitarian art objects in search of beauty, and later the Modernist ideal of poetic abstraction – for “refined tastes” — to an interest in the relationships that are created as artists come together with the public and in the social contexts in which they take place: Bourriaud’s “relational aesthetics” (1998). In other words, we are reassigning to the arts a social function. In his seminal and very influential book, Bourriaud attempts to reveal the principles of these contemporary artist’s thoughts in the age of globalisation, explaining them as: “an aesthetic of the inter-human, of the encounter; of proximity; of resisting social formatting” (Bourriaud 1998, book jacket). It was in the revolutionary 1960s and in its aftermath that postmodern artists began in earnest to devise novel kinds of art-making and arts presentation that are community-oriented and politically engaged. (Since the invention of art, there have always, of course, been artists whose work was revolutionary and political in its aims.) These novel postmodern kinds of arts events include: site-specific art, large-scale art and performances in public spaces, installation, community arts events, political art, ephemeral and performance art, art walks, time-based arts, the use of abandoned or private buildings not built for artistic use, the integration of “the everyday” and the integration of non-arts-skilled people (e.g. non-dancers) into the art works and performances, home theatre and more. The contemporary arts curator’s vocation virtually arose from the demands of this predicament: how set up the conditions for these artists to present their iconoclastic, renegade work, and to help in bringing a better understanding of the work to the public. In my 36 years of dance presenting, I have come across an extraordinary range of innovative curatorial models, projects and visions that are engaging, immersing and transforming audiences, neighbourhoods and sometimes entire communities — getting them out of their seats and literally activating their participation. Here are a few examples. (1) In-house events. There is a centuries-long tradition of the wealthy classes presenting artistic performances in their mansions, but lately there has arisen a new wave of “home theatre” events (in France called théâtre de l’appartement) and also “house concerts” for music performances in rural places. To buck the notion of institutionalized artistic legitimacy, Berkeley, Californian tech-savvy arts provocateur Philip Huang has used the internet to create a DIY global network of living room performances in the guise of Home Theater Festival in cities and towns around North America; U.C. Davis researcher Frances Dyson has studied a sound festival in a small city in Australia who arts venues are closing and where performances have been taken into local residents’ houses; artist-curators, like Montréal artist-curator kg Guttman and Aurélie Pedron, are staging performance events for small groups or even for one spectator at a time in their own apartments. (2) Neighbourhood arts. What if an artistic event was the outcome of a citizen committee of local residents, or took place within a particular neighbourhood itself and reflected the desires and interests of those who lived in proximity to each other? Independent curator Julie Rodeyns explains the “New Patrons” experiment in Belgium which cast a group of local town residents as the initiators of a commissioning project to create an artwork for the public good; in Bordeaux, France, community-minded curator Jean-Paul Rathier organized “The Gardens Next Door,” a series events in the backyards of 200 of his closest neighbours along with an artists’ collective; and Peter Sellers, the Los Angeles Festival’s curator in 2000, surrounded the main stage festival with a string of local neighbourhood festivals in various quarters of the city to present works in direct relationship to the communities and cultures where the work was being created and produced; a curator in Jerusalem created a festival which commissions small-scale choreographies for the bars and restaurants of the central marketplace, the one area in a divided city in which all ethnic groups cross pathways on a daily basis. (3) Art walks. In echo of the guided museum visit and visual artist Janet Cardiff’s audio and video walks, the public is offered instructions, information or poetic narratives through headphones as they embark on an individual commented walk or silent group procession throughout a social and geographic landscape, bringing to awareness its hidden character, histories and delights. With the series “Collective Walks of Spaces of Contestation” curated by Mariane Bourcheix-Laporte in Burnaby, British Colombia, drew inspiration from public protests and walking clubs, partnering artists with community groups to create radical experiences for participants as a form of participatory pedagogy; Tedi Tafel stages one-on-one hour-long experiences between a dancer and a single observer, as they move together in silence and empathy through a run-down inner city area. (4) Sharing an art meal. Preparing food or sitting around the dinner table becomes the premise for an intimate community performance event. Justin Chambers’ “Family Dinner” is an immersive and intimate “dining event”, a project that invites a small public to dine with performers and a work is at once a performance, rehearsal, embodied recording, a choreographic exploration of a shared meal and conversation with dinner guests; Food=Need was a 3-day performance of politically engaged “food narratives” organized by artvist Pam Patterson in Toronto that brought artists and community members together in a gathering in a home kitchen, a day of bread-baking and a community potluck, an event that aimed to raise awareness about our needs, wants, anxieties and pleasures surrounding food. It seems that, at last, the time for live arts curation has arrived! At the annual All Networks Meeting of 80+ presenting organizations interested in programming dance, from large and small cities in Newfoundland three weeks ago, the idea of the curator was – at last! – in the air. We spent two days immersed in a symposium, with keynote speakers, panels, presentations by Canada Council officers, and arts advocates, discussing the nature of Aboriginal traditional and contemporary arts in Canada, and how we might all become more engaged with those artists and communities. At that meeting I discovered …the Aboriginal Curatorial Collective. Amans, Diane. 2008. An Introduction to Community Dance Practice. London and New York: Palgrave Macmillan. A textbook for the practice that fosters debate, offers case studies and a toolkit of resources. Bakka, E. (2002). Whose dances, whose authenticity?, in L. Felföldi and T. Buckland (eds. ), Authenticity, whose traditions?, Budapest: European Folklore Institute. Browner, Tara. 2002. Heartbeat of the People: Music and Dance of the Northern Pow-wow. Ubana and Chicago: University of Illinois Press. This dancer of Oklahoma Choctaw heritage and dance scholar discusses the history and tradition as well as the vibrant transformations of these events. Bourriaud, Nicolas. (1998) Esthétique relationnel. (English translation Relational Aesthetics in 2002). Dijon, France: Les presses du reel. He attempts to renew our approach to contemporary art by revealing the principles of artists’ thought: an aesthetic of the inter-human, of the encounter; of proximity; of resisting social formatting. Frakcija #55, Special topic issue Curating Performing Arts. (2010). Croatia. Hamera, Judith. 2007. Dancing Communities: Performance, Difference and Connection in the Global City. New York and London: Palgrave Macmillan. The power of performance as a social force examining amateur and professional dance in Los Angeles. Jackson, Shannon. 2011. Social Works: Performing art, supporting publics. New York and London: Routledge. 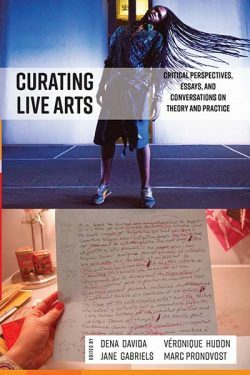 An interdisciplinary approach to the forms, goals, and histories of innovative social practice in contemporary performance and visual art. Kester, Grant H. 2004. Conversation Pieces: Community and Communication in Modern Art. Berkely, California: University of California Press. Discussion of “dialogical” art practices that are organized around conversational exchange and interaction that predates relational arts. Pronovost, Marc. 2013. Art et développement: Le geste creative au service d’un development social soutenable. Paris: Harmattan. A discussion of social art as an effient vector of social and human development. Theater journal 44:2, Special topic issue Performance Curation. (Spring 2014). Yale School of Drama. Duke University Press.